Great fit, great quality, great style. Great looking 'vintage' clothing doesn't have to smell of moth balls and charity shops! 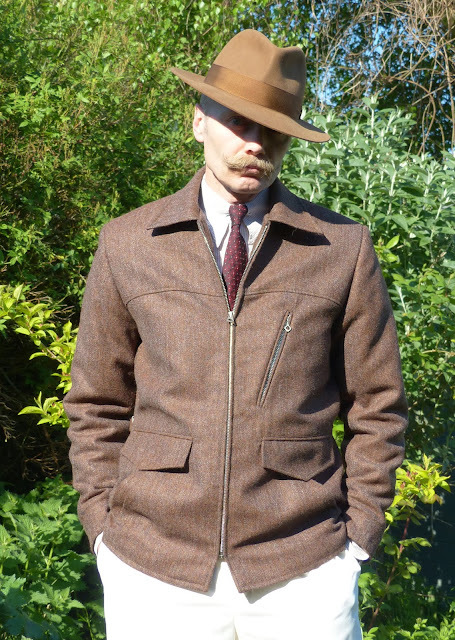 This is the half belt zip jacket in melange shetland herringbone from Chester Cordite. Its based on a 1940s american horse hide jacket, and for those video gamers amongst us just screams 'L.A Noir'. The lining is quilted for extra warmth, it has both flapped cargo pockets and hand warmer pockets, plus a zipped top pocket with 'Talon' style zips. There are side adjustment tabs, and the jacket features western style yokes front and back. The best feature is the authentic pleated 'action back'... very cool. It looks amazing, along with traditional style craftsmanship.